Re-regulating Buses – A Game of Two Halves? And so, maybe, the same could be said about bus services. The public transport trade press has been punctuated in recent times by stories related to plans by various parties to “re-regulate” the provision of our buses. If the object of a game of football is to simply get the ball into your opponent’s goal, the half and full-time “waffle” by “experts” often clouds the issue. Buses too are essentially simple. Provide timetable, turn up at stop on time, get passenger to destination. Of course there is far more to it than that, but essentially, that’s what it is. So I often wonder if the time I spend reading the Nexus plans for a “Quality Contract” in the North East are minutes I shall never get back. They talk about “passenger benefits”, “local policy objectives” and “proportionate in its impact on communities”. Is this buses made complicated? As a passenger, the simplest thing I want is the bus to turn up on time. I can find nothing thus far in the QC plans to suggest that traffic congestion will be effectively tackled to give the bus an advantage. On top of all of this, Nexus appears to be hell-bent on imposing this regime on an area which boasts some of the best passenger satisfaction figures in the country. Where are all these disaffected bus passengers screaming for something better? And then we have Ed Miliband. The Labour Leader has stumbled upon buses in his latest policy pledge to bolster his general election campaign. He claims that buses outside London currently “fail to serve the public interest”. OK, my experience might be skewed somewhat by the fact that I live in a PTE area, but my local day-to-day experience of using buses is that the timetable is good for my needs. It is congestion that screws things up. The commercial bus network, topped up by Centro tenders, serves my “interest” perfectly well. And I know that, seeing the vast majority of it is provided commercially, I am not, as a taxpayer, exposed to any unnecessary financial risk. The nice bus company has also been buying some new buses, and will continue to do so for the next 5 years, providing job security for a lot of people and providing a comfortable, pleasurable travelling experience for me, the passenger. Win- win, I think they call it in management- speak. Now, I know it’s not like that everywhere. I travel all over the country sampling differing levels of service, and, yes, it isn’t all roses in the garden. I’ve often wished the frequency is higher, especially when you get out into the green and pleasant areas. This is a different ball game, but inevitably with a similar end-result. In City/urban areas like the West Midlands, frequencies are usually good enough for most journeys. Operational Managers at bus operators are usually savvy enough to provide supply to demand. On some housing estates, a 30 minute frequency is adequate enough for the demands of the mostly concessionary pass holders needs. On key arteries into the City Centre, a 5 minute frequency is required to cope with demand. That’s how it works. It isn’t essentially difficult. Even I get it as a humble passenger. So what would a quality contract do to so enhance the passenger’s lot in the North East? Perhaps “cross-subsidise” profits from these well-performing City services to provide new links to areas that need bolstering? It all sounds very good, but how long before someone (either a local Councillor after votes or some Clarkson-esque petrolhead) points out that there are buses rolling around “carrying fresh air” (I’ve never heard THAT one before…). And with Councillors holding the reigns of power in such a scenario, I’ll leave you to work out what happens next. Stagecoach’s MD in the North East Phil Medlicott concludes it’s “putting politics before passengers”. I agree with him. Buses are a simple game – turn up on time and carry passengers to where they want to go. I’ve never heard a passenger talk about how the industry is governed – they aren’t interested, and neither should they be. It’s all about the simple experience of using buses – and the customer satisfaction results appear to suggest reasonably good times in the North East. I’m quoting senior bus people here – and of course they would say that, wouldn’t they? They’re there to make a profit, and they do it through supply and demand. The one thing I would throw at private operators as a downside is that they make changes to their services too often, but on the whole, most of them know what they are doing. Some local Councillors think they know better when it comes to bus services – often because there’s votes in it for them – but the commercial model (with honourable exceptions) mainly delivers for the travelling British public. The elephant in the room is the “top up” system of tendered services. The local authorities have ever-dwindling amounts of money to throw at this. When David Cameron promises everyone a “tax cut” as part of his election goodies, this is the inevitable consequence – a further squeeze on public services. So maybe Nexus has a point when it sees the likes of Stagecoach, Arriva and Go-Ahead pocketing it on high-frequency City routes, leaving them to top up from a nearly empty piggy bank on evenings and weekends. But a Quality contract – and transfer of risk of millions of pounds to the taxpayer is an extremely high price to pay for this – and what about the aforementioned busy bodies who will still moan when they see “empty” buses riding around as a result of all of this? London IS brilliant. I never tire of the Capital’s bus services and always look forward to a ride on the network whenever I’m down there. But let’s break this brilliance down. High frequency buses. I know wherever I go in the West End my service will have a high frequency. But hang on. Actually, most of Birmingham also has this. I’ve stood at bus stops in London for 20-plus minutes and 3 have come together, just like Brum – and London has far more bus priority than my City. And then they have a strange phenomenon of promptly terminating routes via some computer-generated voice booming over the bus. That rarely happens in the West Midlands compared to London. Oyster Cards. I have this wonderful bit of kit on a card no bigger than the palm of my hand that gives me freedom to use the buses, tube, some trains and trams in London. But hang on. If I buy a Network ticket in the West Midlands, I’ve got…exactly the same freedom. The only advantage London’s Oyster has over my Network West Midlands ticket is that the credit doesn’t run out after, say, a week or a month. We have “Swift” as an equivalent, but it’s taking an age to get the same benefit mentioned as Oyster. But is this so insurmountable? Passenger Satisfaction. London actually doesn’t score so well as other parts of the country when it comes to satisfied bus passengers. Why is our Capital’s bus network not running away with the league title? It has its own “Brian Clough & Peter Taylor” management team in Sir Peter Hendy and Leon Daniels, and they seem to me to be getting it right, but as discussed ad-infinitum amongst transport people, London is so unique in its governance and make-up, it would seem difficult to replicate its success elsewhere in the country for myriad reasons. Maybe London passengers are just more fickle than the rest of us! London’s cashless bus system is also an interesting move. For regulars, it’s a boon. Hop on with your Oyster or “wave & pay” debit card and it’s all so simple and quick. You can fill a double decker very quickly when people aren’t faffing around with change – ask National Express West Midlands in Birmingham’s peak. They and their predecessors have been doing this since the 1970s with their “exact fare” policy. But hang on. 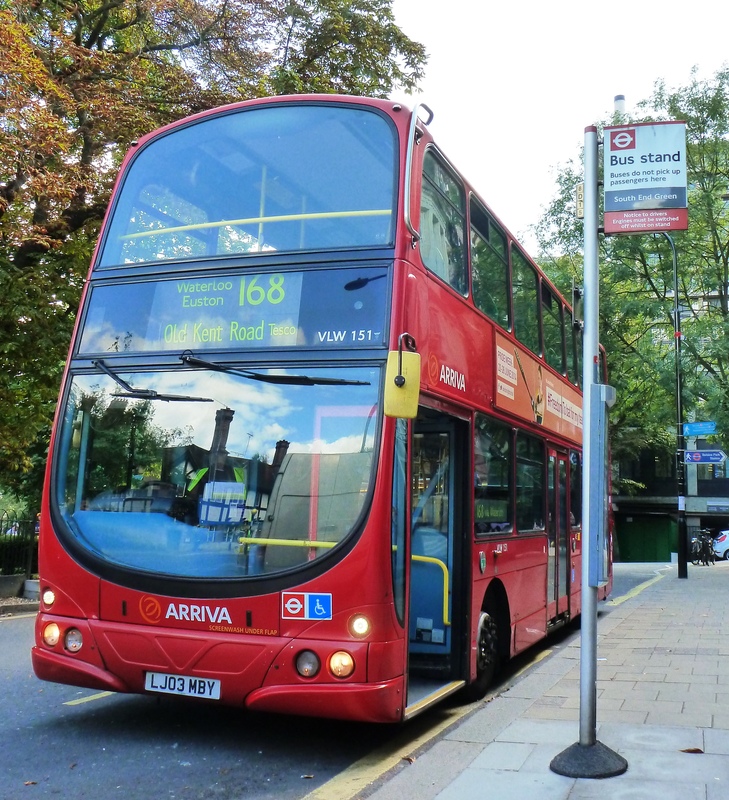 Having “no cash fares” on London buses has one major flaw – occasional users. I found this to my cost only last month. On my way to Germany via St. Pancras, my plan was to travel Birmingham to Euston, walk “next door” to St. Pancras and hop on my Eurostar. But a problem at the West Midlands end saw me unexpectedly using Chiltern’s service to Marylebone instead. Not having planned to use my Oyster, I hadn’t brought it with me, so ended up using the tube from Marylebone to St. Pancras at some extortionate price for a single trip. But I’d actually wanted to use the 205 bus instead. Where do I get an Oyster quickly? How much credit do I have to put on it? Could I transfer any unused credit onto my “normal” Oyster when I got home? All too difficult. And I suspect I’m not the only one to fall foul of having to use the bus at very short notice. The man in the Underground station said I could have “waved my debit card” on the bus instead, but my card is not enabled to do this – and isn’t due to be reissued for another couple of years yet. That’s a long-winded way of pointing out that, maybe, London isn’t all that glitters after you take the wrapping off – and provincial areas shouldn’t always use the argument that London is so much better than their own local offering when it comes to buses. Could the country’s bus operators do better? Undoubtedly. In the North East, the “big 3” have been working hard to come up with (now rejected) proposals to counter the Quality Contract threat. It shows that improvements can always be made. But I’m just not convinced a Quality Contract is the answer to bus passenger’s needs. Deregulated bus services aren’t perfect, but 28 years after the Thatcher administration gave us the “free-for-all” (outside London), the industry has matured . Opponents may point to falling passenger numbers, but we need to delve much more deeply into reasons why this is. Until we have politicians local and national who can see the long-term picture, and are willing to take the often unpopular short-term measure of removing road space from cars in favour of buses, we will remain in this political posturing state of promising something that, actually, fails to deliver when push comes to shove. Buses, like football, is a simple game. Why are we trying to make it more complicated when we know the answers already?